3. Employees (and their immediate families) of the Promoter and agencies associated with this promotion are ineligible to enter. Immediate family means any of the following: spouse, ex-spouse, de-facto spouse, child or step-child (whether natural or by adoption), parent, step-parent, grandparent, step- grandparent, uncle, aunt, niece, nephew, brother, sister, step-brother, step- sister or 1st cousin. 4. Promotion commences 9:00am AEDST on 03/12/18 and closes 11:59pm AEDST on 07/01/19 (“Promotional Period”). 5. To enter, eligible entrants must, during the Promotional Period, visit www.9nation.com.au and agree to become a member of the website by locating the entry form and completing all requested details including full name, contact number, a valid and current email address, post code and date of birth, and submit the completed form. 10. The draw will take place at Nine Digital Pty Ltd, Level 7, 309 George St, Sydney, 2000, NSW, Australia on 08/01/19 at 12 midday AEDST. The Promoter may select additional reserve entries and record them in order in case of an invalid entry or ineligible entrant. The winners will be notified by telephone and email within two (2) business days of the draw and their names will be published on www.9nation.com.au from 11/01/19. 12. 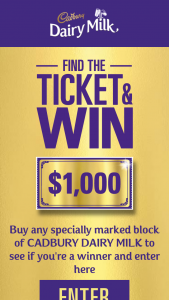 The first five (5) valid entries drawn will each win $1000. 13. Cash prizes will be awarded into the winner’s nominated bank account within 28 days of winner notification. 15. If any prize is unavailable, the Promoter, in its discretion, reserves the right to substitute the prize with a prize to the equal value and/or specification subject to any written directions from a relevant regulatory authority. 16. Total prize pool value is $5,000. Prizes are not transferable or exchangeable and cannot be taken as cash, unless otherwise specified. 17. A draw for any unclaimed prizes may take place on 01/04/19 at the same time and place as the original draw, subject to any directions from a regulatory authority. Any winners will be notified by telephone and email within two (2) business days of the draw and their names will be published on www.9nation.com.au from 04/04/19. 19. If this promotion is interfered with in any way or is not capable of being conducted as reasonably anticipated due to any reason beyond the reasonable control of the Promoter, including but not limited to technical difficulties, unauthorised intervention or fraud, the Promoter reserves the right, in its sole discretion, to the fullest extent permitted by law (a) to disqualify any entrant; or (b) subject to any written directions from a regulatory authority, to modify, suspend, terminate or cancel the promotion, as appropriate. any loss or damage (including loss of opportunity); whether direct, indirect, special or consequential, arising in any way out of the promotion. 22. Except for any liability that cannot by law be excluded, including the Non- Excludable Guarantees, the Promoter (includingits respective officers, employees and agents)is not responsible for and excludes all liability (including negligence), for any personal injury; or any loss or damage (including loss of opportunity); whether direct, indirect, special or consequential, arising in any way out of: (a) any technical difficulties or equipment malfunction (whether or not under the Promoter’s control); (b) any theft, unauthorised access or third party interference; (c) any entry or prize claim that is late, lost, altered, damaged or misdirected (whether or not after their receipt by the Promoter) due to any reason beyond the reasonable control of the Promoter; (d) any variation in prize value to that stated in these Terms and Conditions; (e) any tax liability incurred by a winner or entrant; or (f) use of a prize. 24. The Promoter is Nine Network Australia Pty Limited, ABN 88 008 685 407 of 24 Artarmon Rd, Willoughby, NSW 2068. You can contact the Promoter in relation to the promotion by mail to this address or by telephone to (02) 9906 9999. 25. Authorised under permits NSW: LTPS/18/29815 and ACT: TP18/02256.